An interesting piece of research landed on my desk a few days ago about an observational study that has identified a link between cataract surgery and reduced risk of mortality in women. The research studied over 70,000 women aged 65 and over and after multivariable adjustment, found cataract surgery to be associated with a 60% reduced risk for mortality. The results are striking and whilst open to debate on whether the relationship is causal, they none the less present an optimistic outlook for those undergoing cataract surgery. 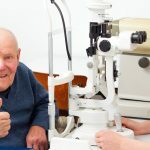 I have certainly found in my own practice that women who have had cataracts removed feel at lower risk of accidents and better able to care for themselves in terms of maintaining independent living. Factors that play a role in maintaining good health such as the ability to drive, read, attend appointments, shop, cook, as well as psychological factors such as improving confidence and the improvement to mood when vision is restored are likely to play an important role here.